Sketch A No. 5 Showing proposed Site for a Light House on Sow and Pigs Reef. This is an unusual 1853 U.S. Coast Survey chart of the Sow and Pigs Reef, located just off Cuttyhunk, near Martha's Vineyard, Massachusetts. Chart depicts the site of a proposed lighthouse on Saddle Rock. 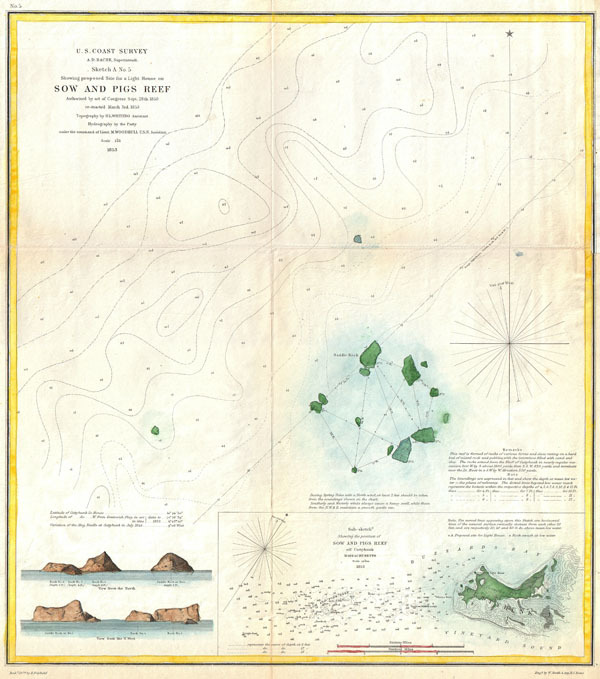 An inset in the lower right quadrant shows the Location of the Sow and Pigs Reef relative to Cuttyhunk Island. Lower left quadrant offers profiles of the rocky projections as seen from the North and from the Northwest. Lower right quadrant offers sailing instructions and notations on the area. The topography for this chart was prepared by H. I. Whiting. The hydrography was accomplished by a party under the command of M. Woodhull. The chart itself was assembled under the supervision of A.D. Bache, director of the U.S. Coast Survey. Very good condition. Minor verso repairs and discoloration on original fold lines. Blank on verso.